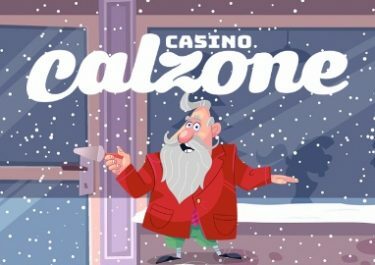 Casino Calzone – Cal’s Christmas Race! Win Mega Spins, Cash Prizes and tons of Cal’s Casino Cash! Holy Calzone, it is Cal’s first Christmas bash in his very own casino. To celebrate the festive season, he is inviting all players to three weekly races with prize of up to 100 Mega Spins, worth €1.00 each, plus a Christmas race running until 24th December 2017 where the TOP10 spinners will share a €5,000 cash prize pool while 25 runners-up players can look forward to tons of Cal’s Cash, his own casino currency that allows players to spin on the Holy Calzone Wheel where they can win more prizes. Do you like a proper Christmas wager race? Then Casino Calzone is the place to be in December 2017. Weekly leader boards will reward the TOP25 players with Mega Spins and the monthly leader board will have 10 players sharing a €5,000 cash prize pool and Cal’s cash prizes for 25 runners-up contestants. Each week the TOP25 scorers will be rewarded with 5 – 100 Mega Spins, worth €1.00 each. The spins are added on Week 1 – Secrets of Christmas™ | Week 2 – Holiday Season | Week 3 – Merry Xmas by 15:00 CET on 11th | 18th | 26th December 2017. Wagering requirement is 35x FS winnings with a maximum withdrawal capped at €1,000 per batch of Free Spins. Casino Calzone bonus terms and conditions apply. All points earned throughout the weekly races will be added to the monthly leader board. The TOP35 scoring players by midnight on Christmas Eve will win prizes, credited by 15:00 CET on 26th December 2017.